John Gatins has had a long and storied career in Hollywood, working as both an actor and a screenwriter. He began by appearing in low budget horror movies like Pumpkinhead 2 and Leprechaun 3. It was here, while waiting for his close-up on set, that he began to pour over the scripts and learn there structure, becoming a self-taught scribe who suddenly found himself doing rewrites for Varsity Blues. He then soon moved onto a career in sports themed projects, stepping behind the keyboard for Summer Catch, Hardball, and Coach Carter. This lead to his directorial debut, the 2005 film Dreamer: Inspired by a True Story, starring Kurt Russell and Dakota Fanning. During this time, he was also working away on a very personal script, one that he had decide to write for himself, outside of the studio system. Despite being pulled to other projects, which included quite a few acting gigs, he kept coming back to this story about an alcoholic pilot who saves his crew from a crash. John worked on the script for a number of years, but could never quite get the project off the ground. He'd dreamed of directing it himself, but that never quite panned out. For a while, Gatins didn't think his characters would ever see the screen. But then Oscar-winning actor Denzel Washington took an interest in it. Next thing you know, Robert Zemeckis wants to be involved. And the rest, as they say, is history. The cool thing about Flight is, Robert Zemeckis knew how much the script meant to John Gatins. The director brought the writer on as a co-collaborator, and John stayed with the film throughout the entire production, which is rarely heard of for a writer. The two worked as a team, and John Gatins's vision arrives on screen in tact, this Friday, November 9th. We caught up with John to hear more of his amazing story, and to discover just how one goes from acting in schlocky B movies to writing a 2012 Oscar contender for Best Screenplay. How does one go from acting in Fred 3 to writing a screenplay for Robert Zemeckis that has the potential and drive to win an Oscar? John Gatins: (Laughs) Well, to answer your question in truth, I am not in Fred 3. Which is probably part of the problem. I am in Fred: The Movie, and I am in Fred 2: Night of the Living Fred, and somehow, I didn't survive it. Way to bring up a sore spot! You know what I mean? You just punched me where I live! Sorry, man. I knew you were in the Fred movies, and I was flipping through Netflix and saw the third one. I just assumed that they would have invited you back. John Gatins: Right. That is too funny. But seriously...What takes you from being in a movie like Fred to writing a film like Flight? They are really on two different sides of the world. It's frozen pizza next to an Armenian banquet. What is your first passion? Writing or acting? John Gatins: It's funny. Someone just asked me that same question. I guess I should have had a more buttoned up answer. John Gatins: One word? After Vassar, I came to Los Angeles to become an actor. It was the first thing I could think of. I wanted to be involved. I just loved the world of storytelling, and theater. So, acting was my first instinct. It wasn't until after the first couple of years, and reading through so many scripts, that I realized I'd like to try writing. I was self-taught. I taught myself the form, and the three-act structure. I took a shot at writing a script, which I actually sold to one of the Disney companies. Then that script got me to rewriting an older script called Varsity Blues. I was able to stay on that movie through production, and I became friends with the director and his producing partner. We stayed in business for years. We worked together for a long time, and we made a lot of sports movies. I wrote my way into the opportunity to direct a film for DreamWorks called Dreamer, with Kurt Russell and Dakota Fanning. So, I learned the world and I got more access to more material, and more material. It was after I did Dreamer that I went back to this story I had started in 1999. It was about this alcoholic commercial airline pilot. It was never suppose to be a script. It wasn't an assignment. A lot of times, I will have to work on an assignment, where it is a specific thing, or it's a true story. It's a story about a specific sports team, and everyone already knows what the beginning, the middle, and the end should be. With this movie, I never knew. I knew I wanted to write about this character. I wrote the first forty pages, and then I walked away. And then I picked it up. I had to chip away at it here and there. It was my own personal Rubik's Cube, because I never knew that it would get made. Because I knew it was a difficult piece of material. Because I knew it wasn't a specific genre. It was R rated. It had a very conflicted character. It was morally ambiguous. It was more about me working out my own personal interests, and at the same time, having a creative outlet to write about events, and themes in my life that I was curious and interested in. So, after I directed that movie, DreamWorks asked me what I wanted to do next. I looked at some stuff for them. Then I said, "I want to be honest. I have something I want to show you." So then I showed them the forty pages, or so. They had me finish the script, and it took another 18 months. I worked with the producers, and I got a draft together. There was a 2007 script that we actually started to show people. That was the one that moved the ball. It was many years later that we finally got it done. Because I was trying to direct this movie for a long time. And it almost came together a few times. There were brushes when certain actors would be interested. But it never came together. There were a lot of things that waylaid us along the way. 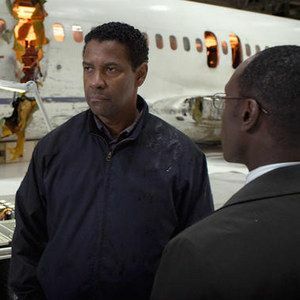 Ultimately it was about getting it in the hands of Denzel Washington, which really moved the needle. Almost simultaneously, Robert Zemeckis read the script and said, "I want to do this!" So, it was the confluence of those two events that really gave this tremendous movement. Having wanted to direct it for so long, was it hard to hand it off to someone else? No matter how capable those hands could prove to be? John Gatins: That is a great question, but everything about this movie has been unique. From trying to write the screenplay about an unconventional thing, to like how it got made. I never argue with my wife. I am thankful for that. But this is the one thing I would always argue about. Because I would say, "I am going to go direct this other movie." And she would say, "Why would you go and do that? You have this script that everyone loves." I'd say, "No one will make it with me. I can't get it done. It's destroying my life, this project." It put everything on a static hold. I would do other things to survive, but I was not directing other movies. I had some interesting things come my way. And they were commercial. I had to think, do I want to go through the building blocks of making a commercial directing career? Or do I want to stay psyched to have this thing find its way? Then I got to the point where Robert Zemeckis calls, and they say, "Bob wants to meet you." I took the meeting. I drove up there and had lunch with him. It turned into six hours in a room together, just talking about the script, and talking about the character. At one point, Bob stops me and he asks me this question, "Are you okay with me doing this?" I said, "I am. Because I can't do it without you. Believe me, I've tried." He was incredibly cool and collaborative, and he said, "Look, I want you to come with me." He invited me to go and be a real, true collaborator and a voice in the process. Which is rare. Everything about this movie has been incredibly rare. I went, and I was there the whole time. It was as though I got to co-direct the movie. It was cool how egoless he was. He was trying to execute the movie in the best way that he could. It was the best version of it happening this way that it could ever be. When you watch the movie, do you still see your voice on screen? John Gatins: Yeah. That is exactly right. Because, you know, now, we have become very good friends. And we have spent a lot of time together since the movie. Its fun to be talking about the movie, because people are seeing it. I just came from the Hollywood Foreign Press. We were talking about the movie, and they asked me a bunch of questions, and then they invited Robert Zemeckis in, and they asked him a bunch of questions. Bob has respectively said that this was a very courageous screenplay, and that is what made him do the movie. He continues to give the script a lot of credit for what ended up on screen. And the actors, too, have been so respectful and nice. That is the rare experience that this movie has been. It feels good to hear John Goodman tell an audience, "It was on the page." When they were telling him how amazing his performance was. He kept saying, "It was on the page." All of the actors have been incredibly supportive of the work I did. It was an amazing joint effort among everyone. We didn't have a lot of money, and we didn't have a lot of days. People really needed to roll up their sleeves, and do a good job, and work hard through these long hours and long days. It was about really adjusting, but that's the kind of movie that it is. The scene with the flight. And the accident. It seems to me that you could take that visual centerpiece out, and still have a really strong, great emotional experience with this movie. Was there ever a moment where you considered taking that out to get it made before Robert Zemeckis came aboard? John Gatins: Inside those first forty pages that I wrote, that sequence always existed. Maybe it's my horror movie beginnings as an actor that allowed me to have the devil's dream fear of flight. "Oh, my god, we're going crash...No, its blue skies, we're all right...Oh, my god! No! We are going to crash." (Laughs) I figured this was a chance to create two parallel storylines, and pick convergence points for them. That was part of the picture that I knew I always wanted to archive. So that sequence was always in the movie. I needed it, because it gave gravity to the situation. Denzel Washington said something very smart. He said, "Look, this is the most dramatic way to set up this character as an airline pilot, in an extreme situation." If the guy worked at the post office, it would be a different movie. Not necessarily a worse movie. It's a different movie. That is what I think you are jumping to. If we lifted the crash sequence, it would still be this taunt character examination of a guy who has to make tough decisions based on ethics in terms of what we consider the truth. Along the way, there were times when people would say, "Look, actors love this script. You are going to have to take it out of the studio system." The fear for me was that I'd never done that. I grew up in this business always working within that system. It was the animal that I knew. It made me uncomfortable to think, "Ok, I am going to make this movie with a really great actor who is not in the studio system." So to speak. No plane crash, it's a smaller budget, and its going to be an even more microscopic examination of this. It would be a fascinating movie, but I love that we got the opportunity to do this. Its like Bob keeps saying, "These movies don't come around a lot." Hollywood isn't conditioned to make movies like this these days. Denzel Washington said on a panel in New York, "I'm not sure Kramer vs. Kramer gets made today in Hollywood." He said a movie like that, that is a drama, and it takes breaths. It's a patient study, and it's not easy. Its true. Its R rated. Which is another thing that makes studios go, "Hold on a minute!" They don't spend a lot of money making R rated dramas. They are atypical business. And we understand that. John Gatins: Yes. Agreed. 100%. Speaking to that, are you the type of writer that lets it all pour out of your head without limitations? Because I know a few independent writers, and they fall into the trap of limiting their imaginations to the budget they know they will eventually be working against. John Gatins: That is a great question. And I can only answer it through the lens of what I am doing. With something like Flight, I didn't have a boss. I didn't have a studio. It wasn't an assignment. It wasn't a rewrite. It wasn't a pitch that I sold, that I had to sit down and write. There was none of that. It was literally...Interior, Hotel Room, Night...I started there. And I could go. If I am writing a sports drama, I have to limit myself. Which are movies that I love. I grew up watching them, and I have worked on a fair amount of them. Its like, they have a specific structure to an extent. You have to find your moments inside that, and be creative. You have to create those movie moments, and invest your audience in different characters, and themes, and the things that happen. But that is a specific thing. In a sports movie, you wouldn't have a seven page monologue from the gaunt young man, who is smoking a cigarette, and you have three people close to death, and he is talking about God. That doesn't happen. That scene doesn't survive many movies. It just doesn't. Its one of my favorite moments in this movie, because of the fact that we take a right turn. It serves a great purpose, because our two characters meet. But you could argue that the movie would exist without it. Or even a much shorter version of that scene. We shot it exactly as I wrote it, and there it is in the movie. John Gatins: It was amazing. I know people talk about the plight of the writer being diminished. Or, as soon as the project movies towards production, we get swept under the rug. I have to say, that hasn't been my experience. That's not to say I haven't found my challenges in that world, with what gets handed off. You have less say. When I sit down and I write Flight, and no one even knows what I am writing, and no one is paying me to do this...I get to be the creator. Right? It is the voice of one. If someone hires you to do it, or pays for the material, you have someone that can have a lot of influence over what goes on. With Robert Zemeckis, he was never anything but respectful. He is a writer himself. So we made it collaboratively. We really did. And that was an amazing thing. To watch him do what he does? I laugh at times, thinking, "Wow. I couldn't do what he is doing right now." Just the three hundred digital shots that went into that crash sequence...It was incredible to watch. I've learned more about filmmaking from him more than anybody.